Quality: Select ears of corn containing slightly immature kernels or of ideal quality for eating fresh. Canning of some sweeter varieties or too immature kernels may cause browning. 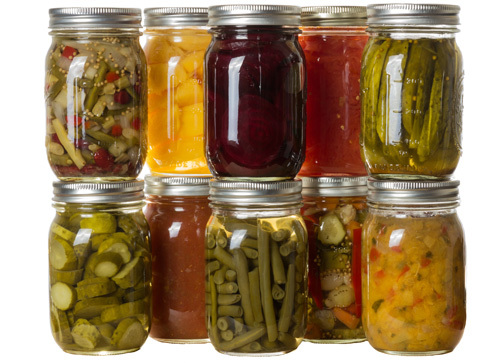 Can a small amount, check color and flavor before canning large quantities. Select well-filled lima bean pods with green seeds. Discard insect-damaged and diseased seeds. 3. Husk corn, remove silk, and wash. Blanch 3 minutes in boiling water. Cut corn from cob at about three-fourths the depth of kernel. Caution: Do not scrape cob. Hot pack or raw pack according to instructions below. Combine all prepared vegetables in a large kettle with enough water to cover the pieces. Boil gently 5 minutes and fill jars with pieces and cooking liquid, leaving 1-inch headspace. Add 1 teaspoon salt to each quart jar, if desired. Fill jars with equal parts of all prepared vegetables, leaving 1-inch headspace. Do not shake or press down pieces. Add 1 teaspoon salt to each quart jar, if desired. Add fresh boiling water, leaving 1-inch headspace.